Kjeld very often uses his little wooden boat to get there, but this day a supply boat was sailing. The island is a wonderful holiday place for the owners, who visit now and then in the season. Even though we arrived unannounced we were welcomed really well. "A little dram" for welcome, and so it continued with good food, drinks and talks into the wann summer night. Danish hospitality at its best. This together with bright sunshine over land and sea, and not to forget a very interesting professional talk, made a very memorable day. Hjelm - Norwegian Land ? Kjeld can also tell us that the island in the end of 700 AD could probably have been ruled by the Norse. In the year 1286 a Danish king was murdered in Jutland. One of the guilty carne to hide with the Norwegian King Erik Magnusson, who helped his Danish friend to build up a fort on Hjelm, which could be used as a base for raids and pillage tours into Denmark. 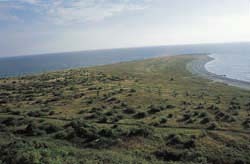 There have been several excavations on the island, which confirm this theory. Already in the year 1854, when the lighthouse was build, some Norwegian coins were discovered! Until 1961 people lived on the island on a permanent basis and farmed cows, pigs and sheep. After this period the island has only been used as a holiday place. Nature on Hjelm changed from open culture landscape to bush land. Old photos show what it has been like. lt is mainly hawthom that has grown over the former fann land. There are hares and pheasants on Hjelm. The hunting is let out, but the hunters have growing problems to find their prey ! This was the reason why Kjeld came to the island with sheep. He even got the opportunity to buy a small share of the island, the only one outside the farnily. " I just feel like a cat among ennines ", says Kjeld with a smile. Some of the owners have now bought an ewe each, which give back lambmeat. This was the beginning of the sheep group with Kjeld as supervisor. Kjeld's profession is foresting. He started with organic Christmas tree production. Sheep under the trees was a good alternative to pesticides. 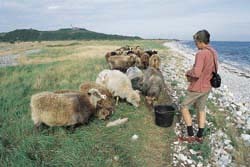 He used the finn-landrace sheep. But the breed with nonnally more than 2 lambs was too risky on Hjelm. 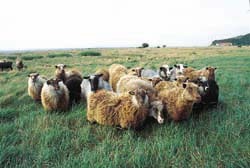 Another northem short-tail breed was chosen,the spel-sheep. 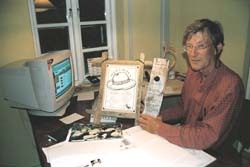 In 1981 two imports of spel-sheep came to Jutland, one from Sandnes, Rogaland, and the other from Furesdalen, Telemark. lt is a mix of their opspring that is grazing on Hjelm; this winter 18 sheep incl. 5 gimmers and one ram. The first two years the sheep flock was wintered at home on the mainland, but after that, the sheep have stayed outside all year. lt has gone real well, but as a matter of fact, being on the border of the Danish animal welfare law, says Kjeld. We have been concemed since we started up, and the private Danish Animal Welfare Association is kept inforined all the time. The lay-out on Hjelm is controversial - a sheep flock on its own is far away from mainland intensive production ! During four years, there have been a loss of about 4-6 small lambs ( 2 to 4 days) and two grown-up lambs. No ewes has been lost. Lambing is 160% - 170%. The herd is not treated against ecto/endo parasites. The little lung worin has been found, but is no problem. Kjeld says, he hope to build up a natural immunity. About 10 km. North of Ebeltoft, on the eastem coast of Jutland lives a real Norway-friend and sheep farmer, Kjeld Malthe-Bruun. Not only is he in Norway during spring and autumn on hill walks and sheep gathering in the Ryfylke mountains in Western Norway, he has also got spel-sheep on Hjelm, a little island 6 km. out in the sea, his flock is grazing throughout summer and winter. Kjeld is especially interested in sheep behaviour through the year. We (Sau & Geit magazine) have been invited over on one of his many inspections and study tours to Hjelm. Kjeld with some of his distinctions from Norwegian friends in Ryfylke. At the table rams from Austevoll that he is hoping to import next year. He has an opinion on the early lamb loss. There is a significant difference in ewes when it comes to mother instincts. Some of them have their lambs directly close to their body, others a meter away. If the lead-sheep suddenly decides to walk away in the middle of a dark April night, the flock immediately follow her. That could be a disaster for ewes/lambs with weaker bonds. lt is evident too, that spel-sheep is a very silent breed. Everything seems to work automatically - very much to the frustration of the shepherd, says Kjeld. The flock is grazing very close together all year. The strange thing is that two of the stronger ewes have lost one of their lambs each. Maybe they are more concemed about their position in the flock than their larnbs, says Kjeld. These two ewes will be slaughtered. Kjeld is very keen on further progress in his sheep flock. Specially finding an ewe, which can live in organic balance with nature on Hjelm. He has been concemed about inbreeding, but has realised that some extend of inbreeding is necessary, even inevitable, because survival is the keyword for the future. To push this process, Kjeld has been to Austevoll, on the Norwegian west coast to chose two rams. On some remote islands the ancestor of the spel-sheep still lives. They have been selected out to survive through many centuries. That should be a good example of "back-breeding", says Kjeld with an ironical smile. In the family their are many opinions about what to do with the still expanding bush land, because it is evident that the sheep can't stop it. They prefer the lower coastland close to the beach, which is still open. They even prefer the stony beach itself with it's sappy plants, fresh ashored seaweed and the salty water from the sea. The sheep are gathered and shom once a year - end June. Most of the sheep have already lost some of the wool, but some have to be shom. Very little of the wool can be used, as it is full of vegetabile matter. The sheep are slaughtered on the island for own consumption. Prince Nicolai was baptised, the main course at the royal dinner was lamb from Hjelm. Scrub is invading the grassland on the westem lowland. Sheep usually on the plains down to the sea. High plateau with the lighthouse in the background.